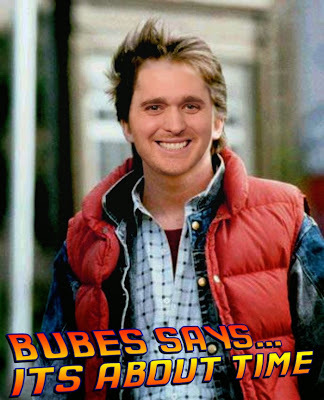 Hi ladies, it's me, Michael Bublé and I was just 10 when the first Back to the Future movie came out. But that didn't stop me from really inventing time travel, going back in time and helping Michael out with those scenes where he would have played two parts. In the third movie for example I played Seamus McFly to save money on all those split screen effects. I also travel back in time to buy my own CD's and donate them to goodwill and also to watch myself live in concert. Obviously I have to be careful not to be seen, since it could cause a huge paradox, or an awesome three-way.